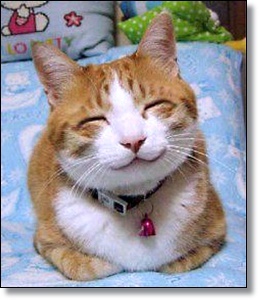 The month of September has been designated as Happy Cat Month. That’s right, a whole month dedicated to keeping your cat happy and, of course, healthy. Provide entertainment for your cat. Make sure your cat has lots of toys to play with and also make sure you set aside some personal time for interacting and playing with your cat. It will help you bond with your cat and also promote exercise, an important part of your cat’s routine to prevent weight gain and to keep your cat’s mind stimulated. Make sure all your cat’s needs are met by providing a clean litter box, perches, hiding places, and scratching surfaces. A clean food and water dish is essential as well. In multiple cat households, you’ll need additional sets of resources. Without these things, your cat is likely to become stressed and may start exhibiting unwanted behaviors. Stress can also be a contributing factor in illnesses for your cat. Keep your cat lean and fit. An overweight cat is more susceptible to a variety of diseases, including diabetes. Lots of toys and interactive play will be a big factor in increasing exercise for your cat, helping to burn calories and keep your cat at a proper weight. Diet, of course, plays a role as well. Feed your cat a high quality diet appropriate to your cat’s lifestage. Make sure the diet is complete and balanced. Feed in a proportion that keeps your cat from gaining excess weight. This next tip may not make your cat particularly happy but regular veterinary visits are essential for maintaining your cat’s health. Of course, a healthy cat is a happy one. Don’t forget about your cat’s teeth. Regular oral care will help keep your cat’s mouth healthy and help prevent dental disease, a common malady in cats. If your cat enjoys spending time outdoors, consider providing a catio. A catio is an outdoor enclosure that will confine your cat to a given space and provide protection from the threats faced by cats that spend time outdoors unsupervised. A catio can provide hours of entertainment for your cat. Another option is taking your cat outdoors on a collar or harness and leash. Your cat will enjoy investigating the outdoor environment and you will be there to keep him safe and secure.